"Smart Security for Light Commercial and Multi-Family Applications"
- Lever Option: Jupiter (JUP). - Delivery: All Satin Chrome (626) Schlage S-series Levers are In Stock. Please allow 3-5 days' lead time on all Brass (605) and Oil Rubbed Bronze (613) finishes. Smart security for light commercial and multi-family applications. At Schlage, we know that every product you specify has to stand up to constant use, while meeting your needs for security at every level. Our S Series and S200 Series locks are designed to deliver constant, reliable performance in light commercial applications like small hotels, laboratories and office tenant spaces, as well as apartment buildings. We pay attention to these details so you can focus on creating a functional and aesthetically pleasing environment for your clients. In fact, everyone of our S Series locks meets ANSI Grade 1 standards for safety. - Engineered for long life and optimum durability. - Heat-treated steel locking components for extra strength. - Independent heavy-duty lever torsion springs for durability and long life. The Schlage Commercial S-Series Levers are reversible. Function: The Schlage S-Series Levers are available in Passage (S10D), Privacy (S40D), Keyed Entry (S51D), Classroom (S70D), Storeroom (S80D), and Single Dummy (S170) function. Finish: The Schlage S-Series Levers come in Brass (605), Oil Rubbed Bronze (613), and Satin Chrome (626) finish. Lever Design: The Schlage S-Series Levers come in Jupiter (JUP) design. Cylinder Options: All Entrance (S51LD), Classroom (S70LD), and Storeroom (S80LD) functions are sold Less Cylinder; see "Companion Items" above for all Cylinder & Keying options. All Schlage S-Series Locks come standard with Square Corner Backset Latch (Spring Latch 16-203; Deadlatch 16-203) and Square Corner Strike (10-001). 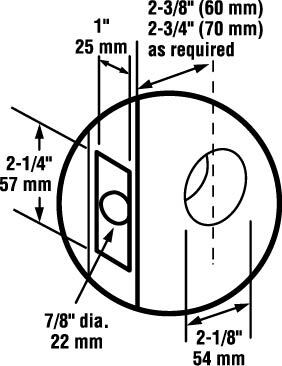 Door Range: 1-3/8" - 2" (35mm - 51mm). S40D: 1-3/8" - 1-7/8" (35mm - 48mm). Latch: 1-1/8" x 2-1/4", Square Corner Faceplate, 7/8" housing diameter, 1/2" throw. Backset: Dual 2-3/8" or 2-3/4" Backset (Spring Latch 16-203; Deadlatch 16-203). Special Order Information: For pricing on any function or finish of the Schlage Commerical S-Series Levers not found on this page please contact Taylor Security direct via e-mail (sales@taylorsecurity.com) or call us toll-free at 1-800-676-7670. Special Order Information: For pricing on any function or finish of the Schlage Commercial S-Series Levers not found on this page please contact Taylor Security direct via e-mail (sales@taylorsecurity.com) or call us toll-free at 1-800-676-7670.